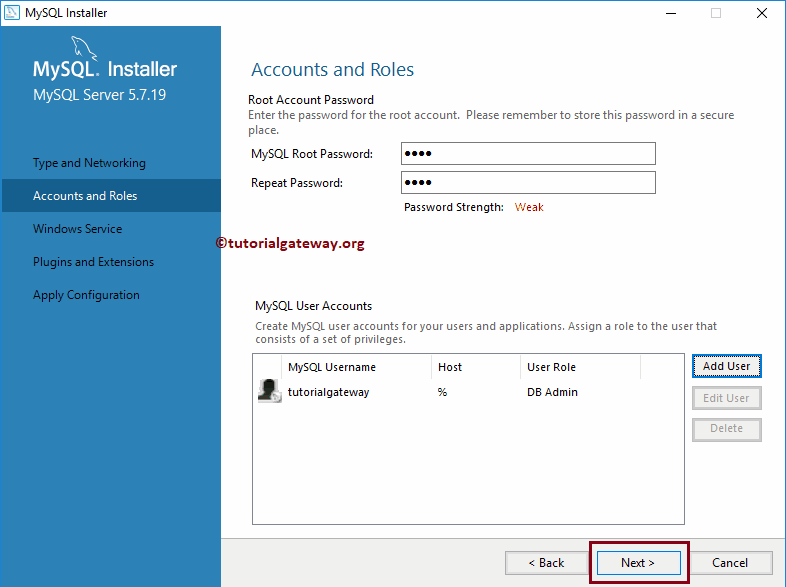 In this article we will show you, Step by step procedure to install MySQL on Windows. It will be same for the Mac as well. 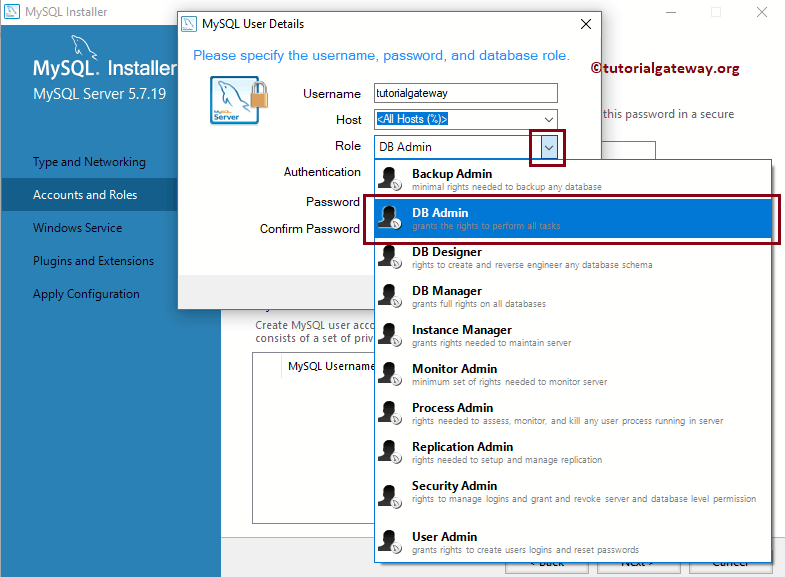 Double-click on the msi file that we downloaded in Download MySQL article. Based on the security configuration, it might ask you for the permission to run. 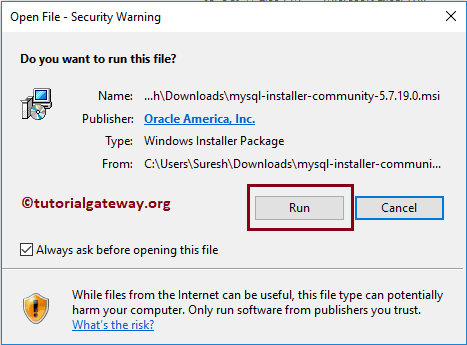 Please click Run button to install MySQL on windows from the below shown pop-up message. 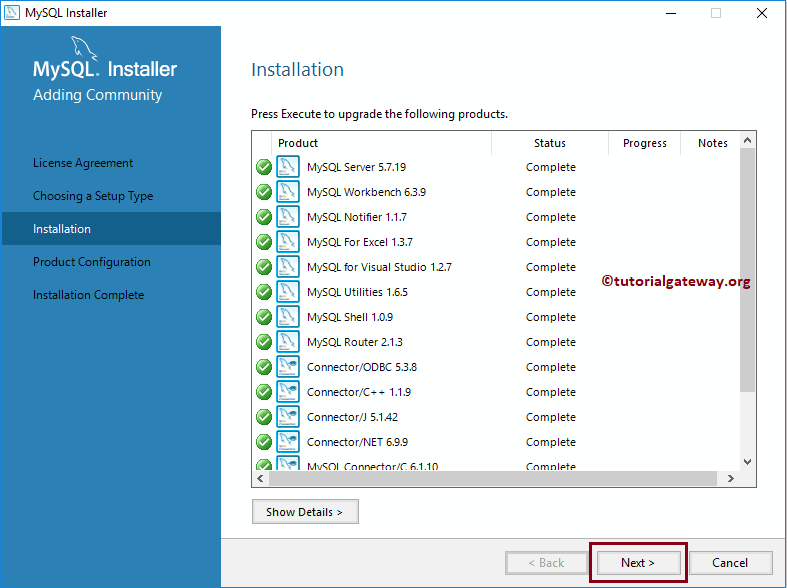 Once you click the Run, a new installation wizard called MySQL Installer Center will be opened. 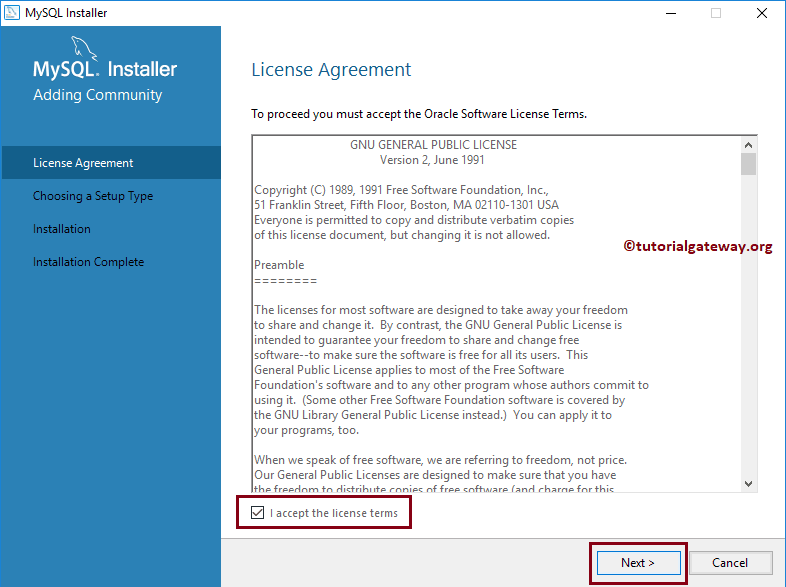 Before you start installing the software, please read the Licence Agreement, and check mark the I accept the Licence terms option. 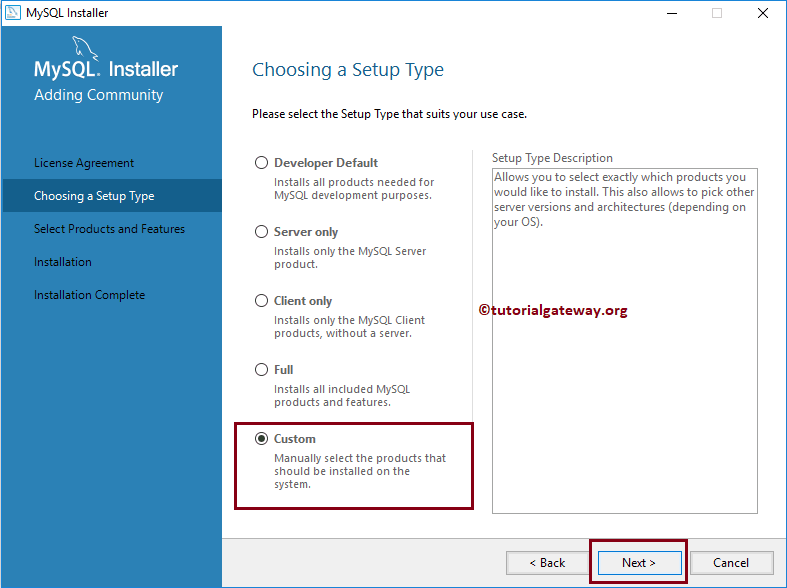 If you are only working with MySQL, or want to learn MySQL only then you can select the Custom option. This will also save the disk space. After selecting the Custom option, Please select the MySQL Server, Workbench from Available Products. And then add them to Products/Features To Be Installed. This will add the Server, and workbench to write queries. 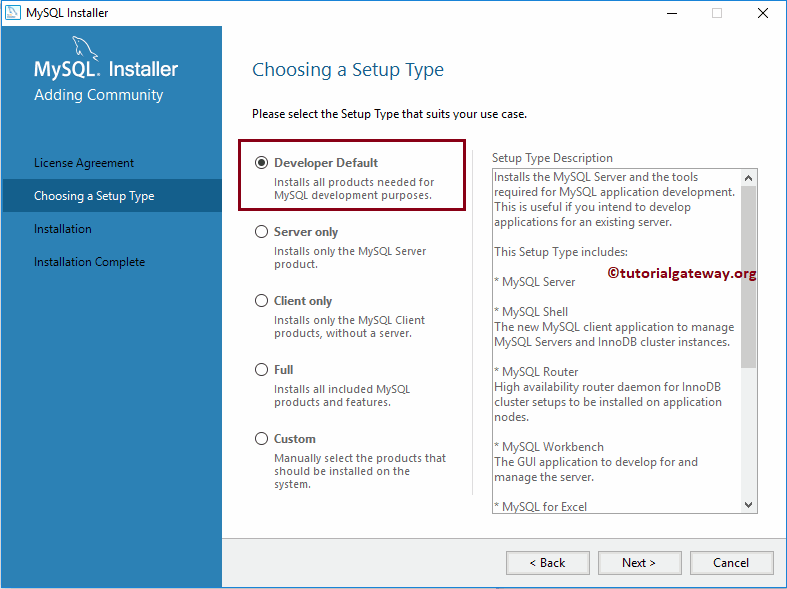 We need all the available products from MySQL so, we are selecting the Developer Default option. If you had more space, please select this option. 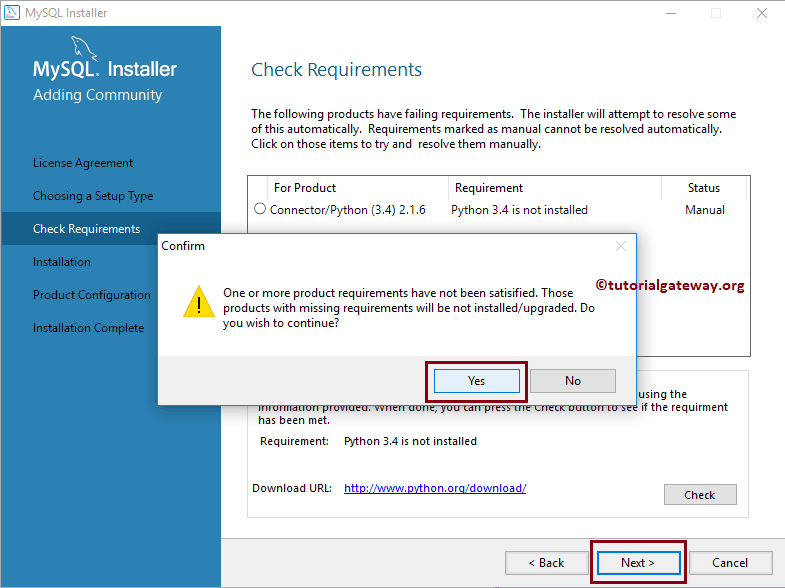 As you can see, we don’t have python installed on this system. 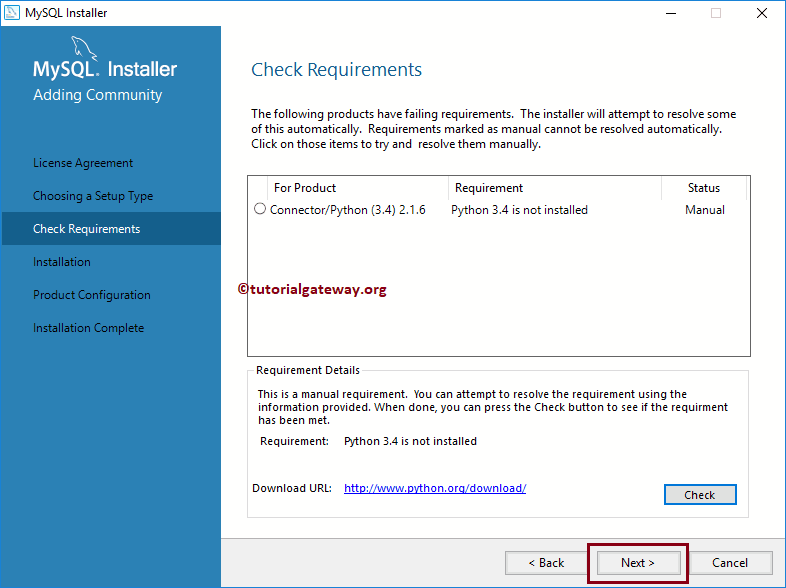 To demonstrate this message, we just uninstalled Python from our system. When we click next button, it is throwing a confirm message box. Click Yes. 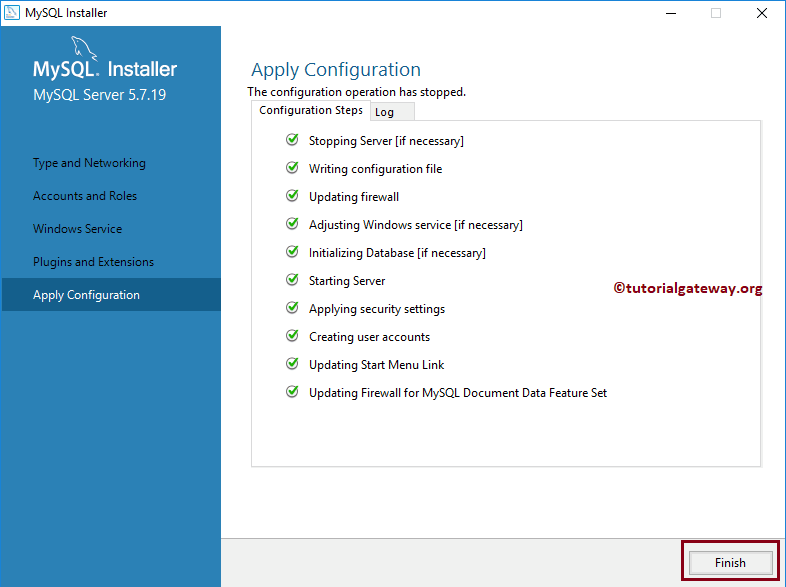 Remember, you will get this message even if you don’t have Visual Studio, or any other supporting software’s. 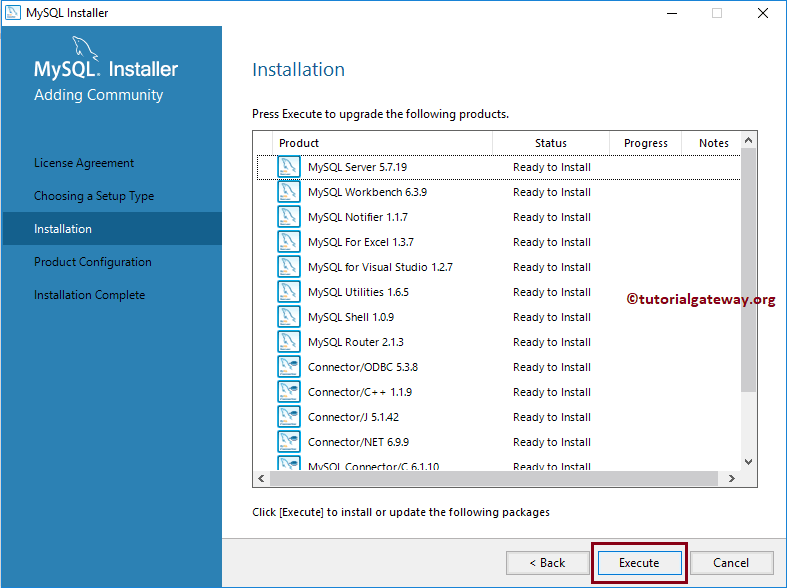 Click Execute Button to install MySQL on windows. This includes all the products that you selected before. 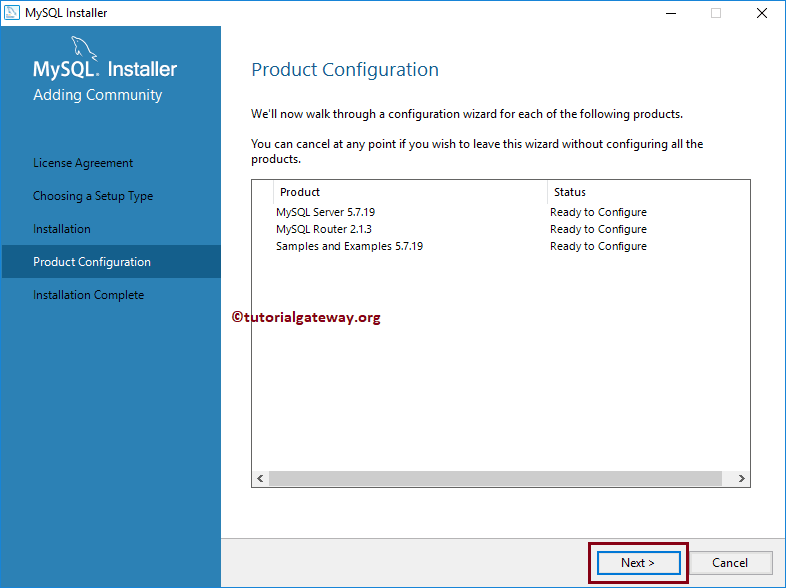 As you can see, products are installed successfully. Click Next button. Product Configuration: Until now, we installed the MySQL Server, Workbench, and remaining products. Now we have to configure the Server, Router, and add Samples and Examples to it. 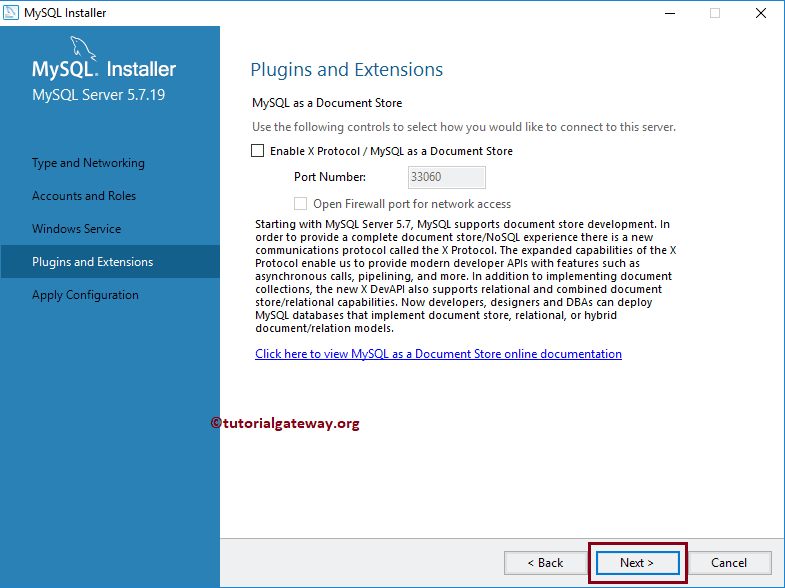 Type and Networking: Please select the first option, and click Next. 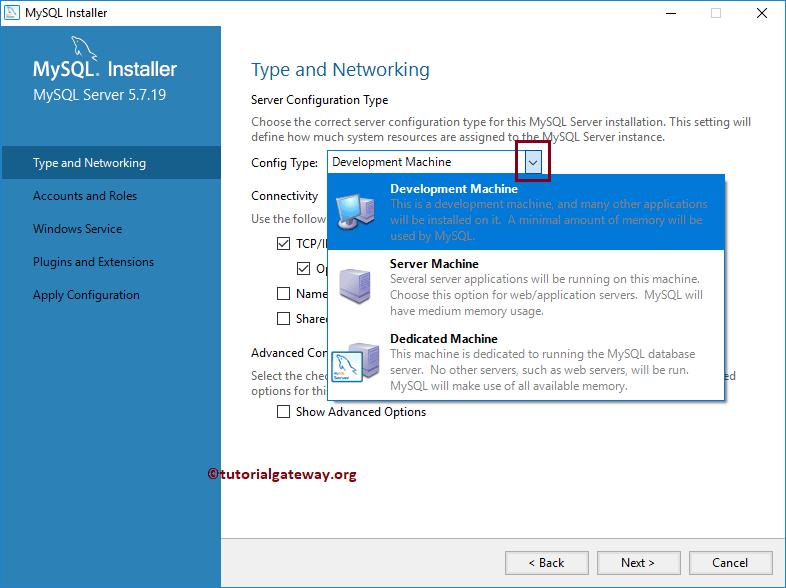 Development Machine: If you select this option, You can use this software as any other software, and consumes less memory. Standard option. 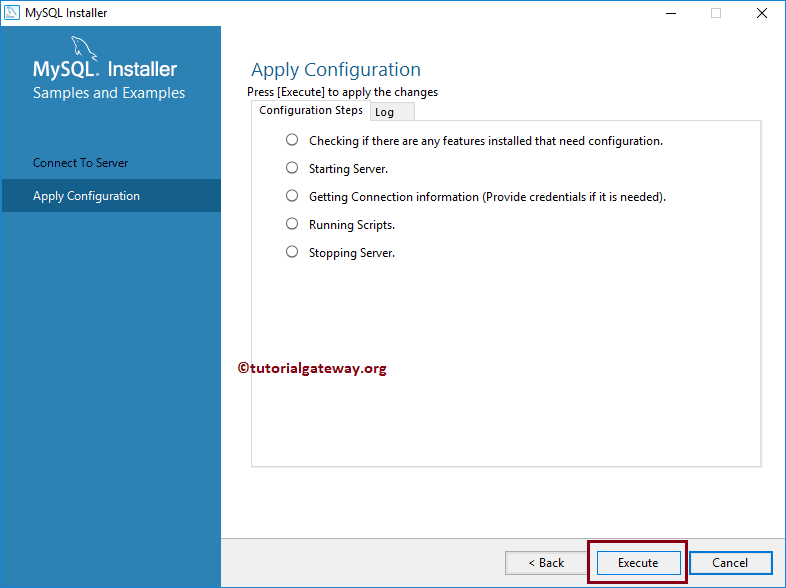 Server Machine: If you are configuring Server-Client then you can use this option. So that, only server application will run in this system. 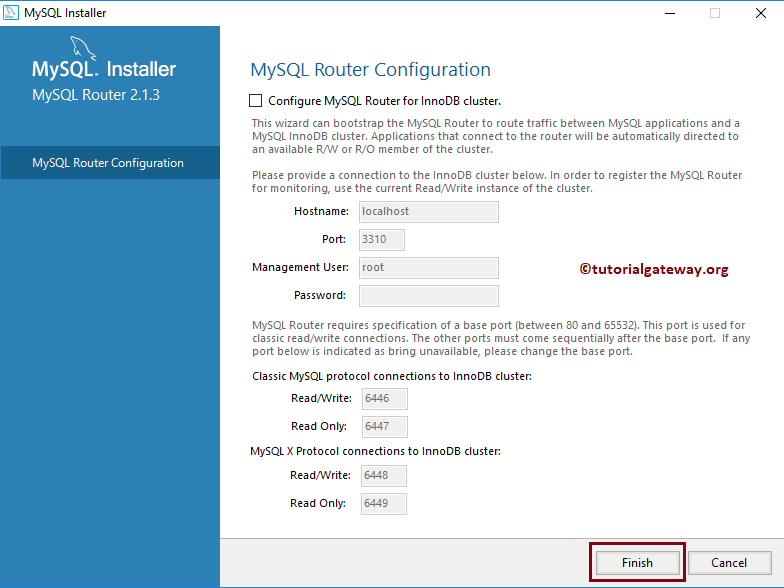 Dedicated Machine: If you want to dedicate this machine to MySQL server then use this option. It will not allow any servers such as web server in this machine. 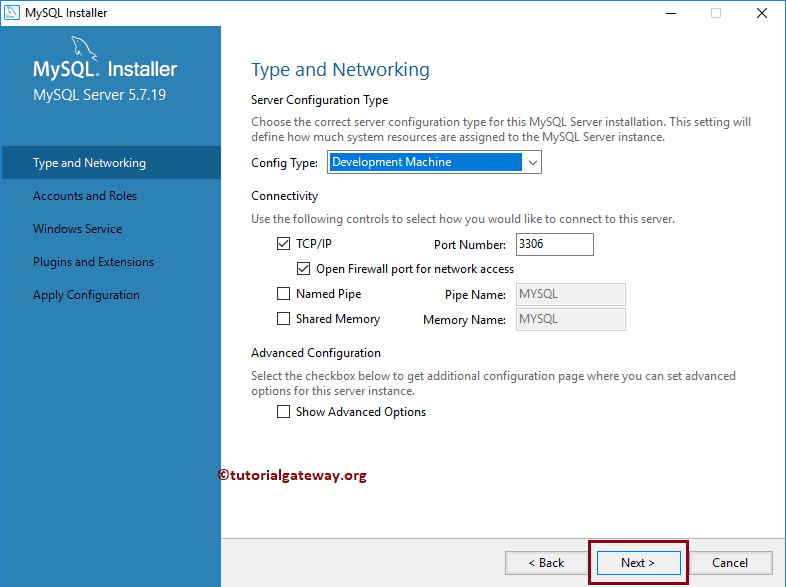 We selected the default Development machine as the config type, and default port number 3306. You can change them as per your requirements. 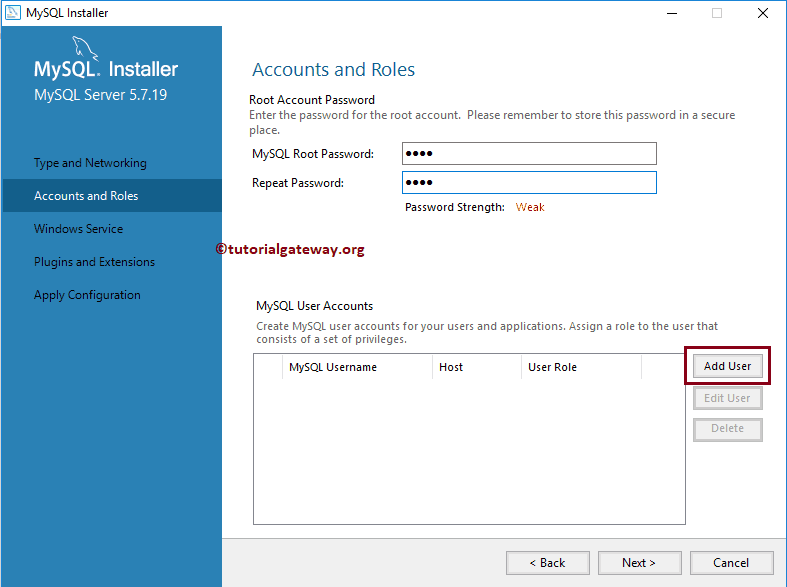 Please provide the password for the root account. 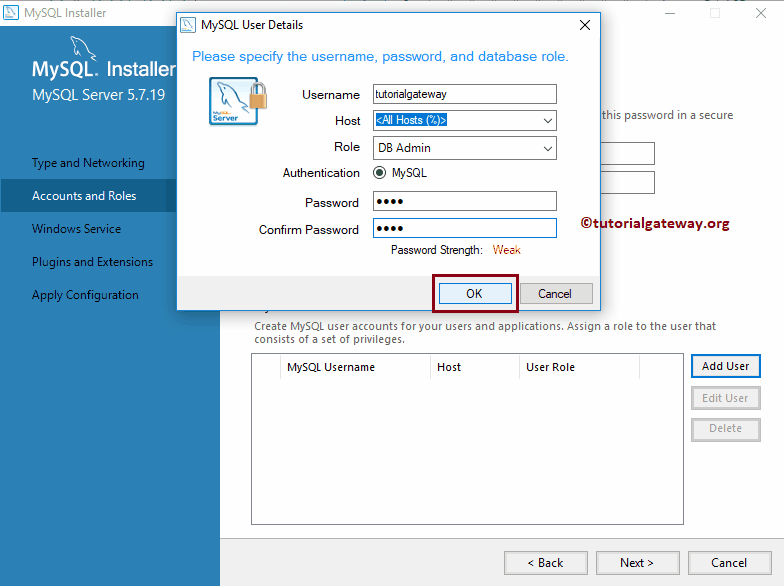 This is the password that you are going to use to login to MySQL from command prompt, or in workbench. 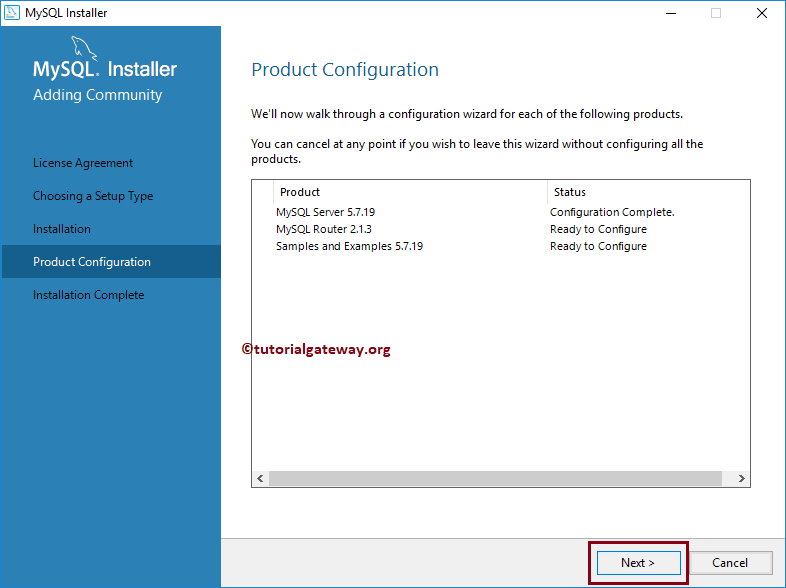 Here, we are adding tutorialgateway user with DB Admin rights. We will write a dedicated post about the Roles, and its access levels. 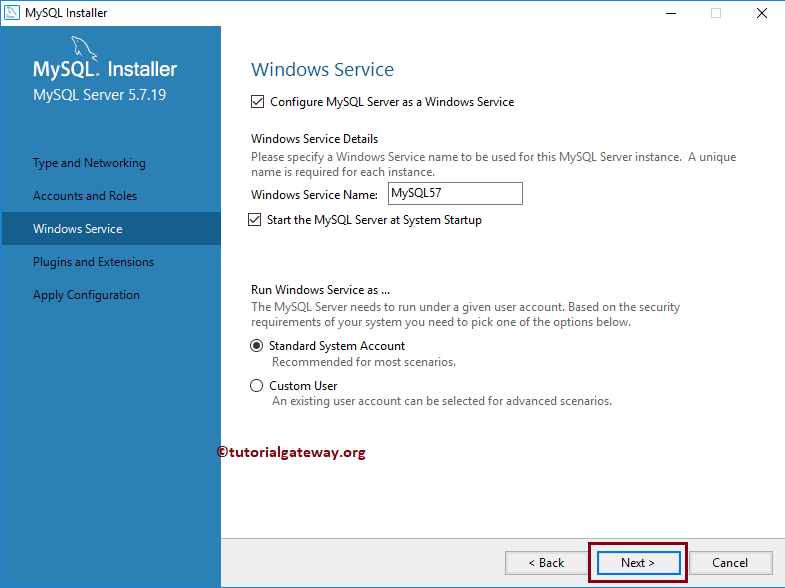 Windows Service: This will add MySQL Service to the windows services, and the service will start when the windows is loading. Click on the Execute button to apply configurations. We will do the Router Configuration in later stage. For now, we are leaving the defaults. Feel free to change them as per your requirements. 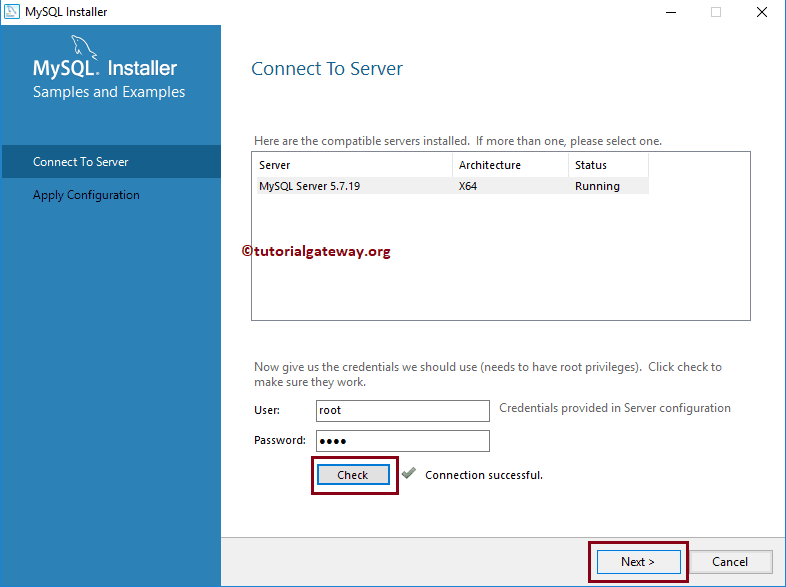 Click on the Execute button to run the scripts that are required to add Samples, and Examples to MySQL. 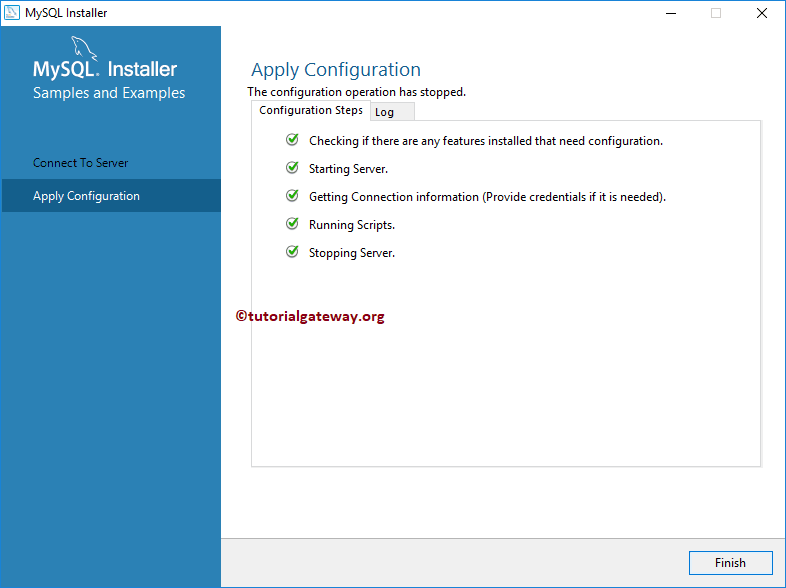 From the below screenshot you can see that configuration steps are executed without any error. 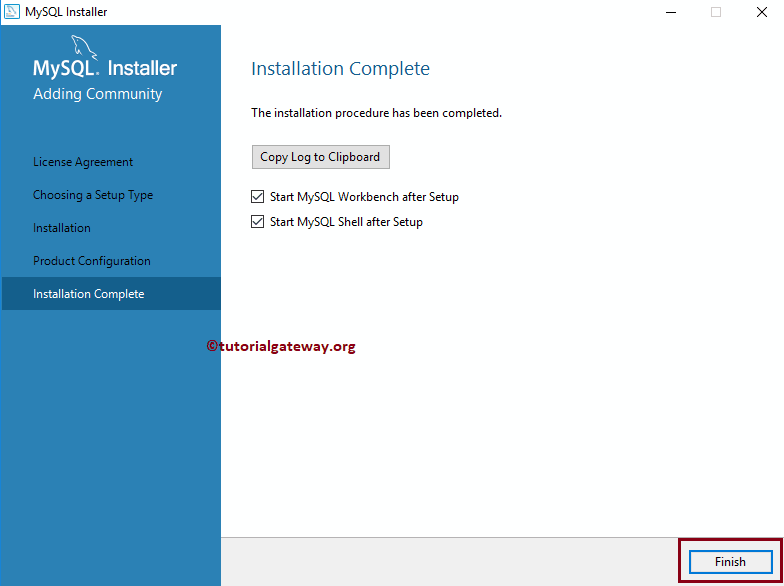 Click Finish button to close the Installer wizard. 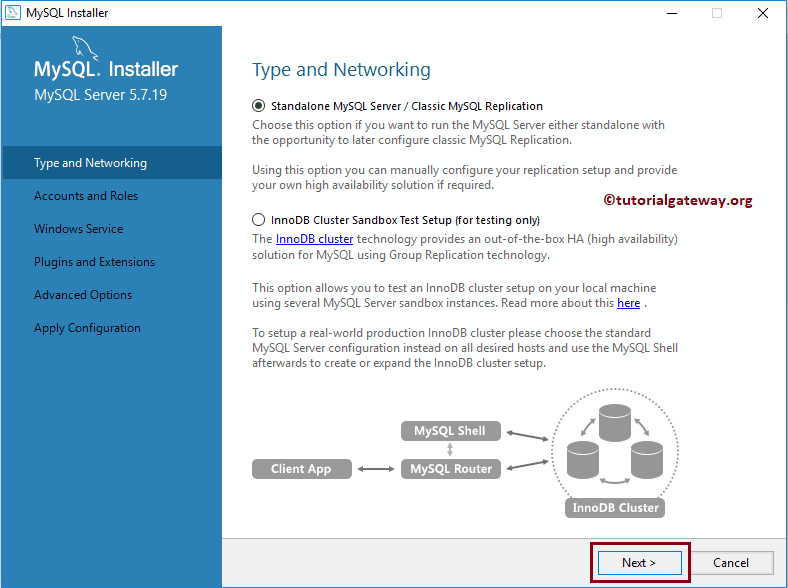 This completes the installing MySQL on windows. 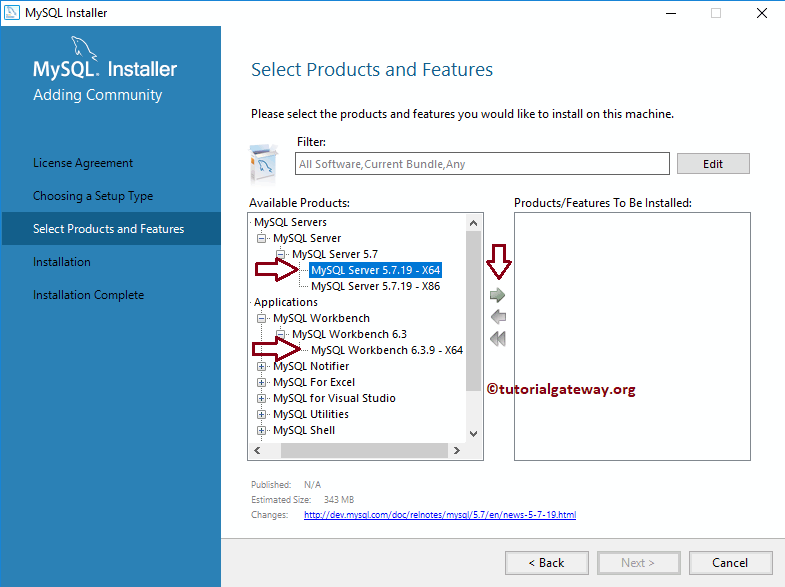 Hope you understood the steps that are required to install MySQL on windows along with Workbench, and connections. 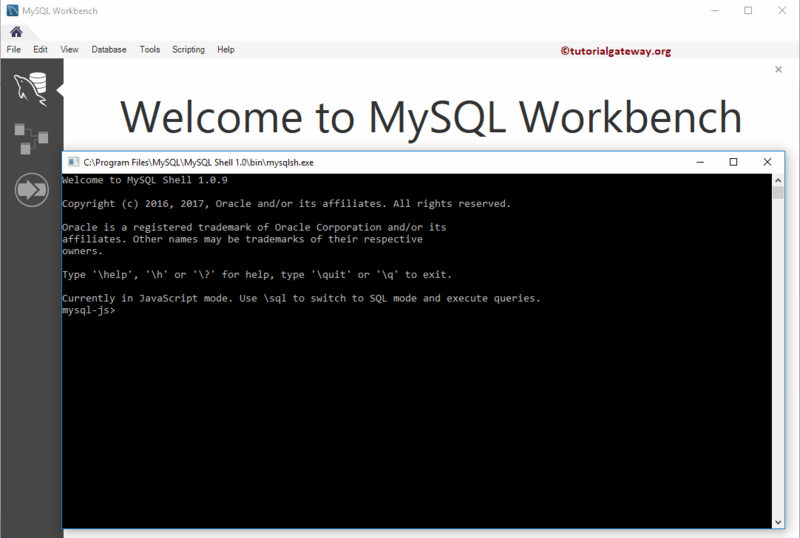 Below screenshot will show you MySQL Command prompt, and Workbench.